Home / Entertainment News, Media News / Is Daily Nation Journalist BARRACK ODUOR behind SHARON’s death? See this PHOTO that has been unearthed. Is Daily Nation Journalist BARRACK ODUOR behind SHARON’s death? See this PHOTO that has been unearthed. Thursday, September 13, 2018 - A photo of Daily Nation journalist, Barrack Oduor, who was kidnapped alongside the late Sharon Otieno, has emerged. The journalist allegedly jumped out of the kidnappers’ car and ran away to a nearby home where he sought refuge before he went to report to the police. A lot of Kenyans have been asking detectives to treat Oduor as a main suspect in Sharon’s murder because his explanation about how he managed to run away from the kidnappers’ car doesn’t add up. The minor injuries he sustained don’t look like those of a person who jumped out of a car which was speeding at 100KM/Hr. 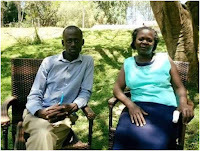 According to Cyprian Nyakundi, Barack and Okoth Obado’s wife, Hellen, have known each other for some years and they are good friends. Here’s the photo of the Daily Nation journalist and Obado’s wife that has caused a stir online.